The Local Shopping REIT (LSR) has provided an update on its Property Sales Programme. Since its last update, LSR has sold or exchanged contracts for sale on 6 properties for an aggregate price of £0.93 million, representing a 1.1% discount to carrying value before sales costs. It says that, of these, 3 properties were sold through private treaty transactions which completed or exchanged for an aggregate sale price of £0.58 million, representing a 5.6% discount to carrying value before sales costs. The other 3 properties exchanged in auctions during February. The aggregate sale price of these was £0.35 million, representing a 7.2% premium to carrying value before sales costs. In summary, the aggregate sales costs associated with all the disposals described above is estimated to be circa 3.5% of the aggregate sales price, resulting in an aggregate realised loss on sale of circa 4.6%. Property sales programme – what’s left? The Company says that it now has approximately £21.2 million in cash reserves and sales of properties in respect of which contracts have been exchanged are expected to generate a further £2.2 million in net sales proceeds in the coming weeks. Excluding properties on which sale contracts have been exchanged, the remaining property portfolio comprises 12 properties. Of these, 6 properties are under offer for sale and the other 6 properties will continue to be marketed, both by private treaty and auction. The aggregate of the carrying values for the 12 properties described above is £4.0 million. However, the company points out that there is no certainty that these carrying values will be achieved on sale. 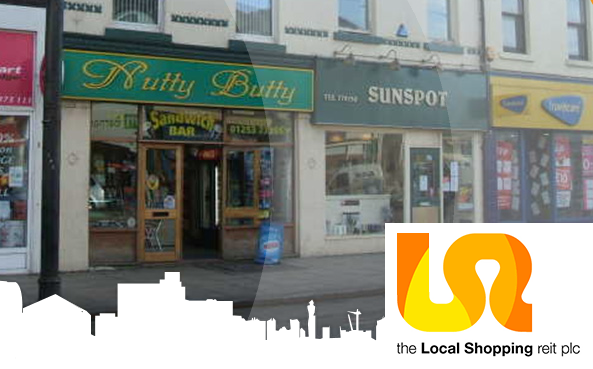 The Local Shopping REIT is a real estate investment trust (REIT) that is invested in a portfolio principally comprising local shopping assets in urban and suburban centres throughout the UK. The Company is now in realisation mode. Its investment policy is to undertake a progressive disposal of its assets, to enable the repayment of bank facilities and the return of surplus value to its shareholders, whilst maximising the returns from the residual property portfolio through sound asset management.